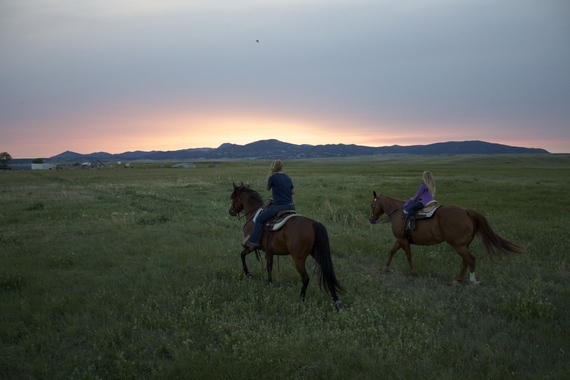 About two weeks have passed since four horses, a white mule named Pearl, Winnie the dog, Sebastian Tsocanos and I were dropped off in the middle of a pasture in Northeast Montana to begin a three-month long horseback trek to document the changing Great Plains landscape. 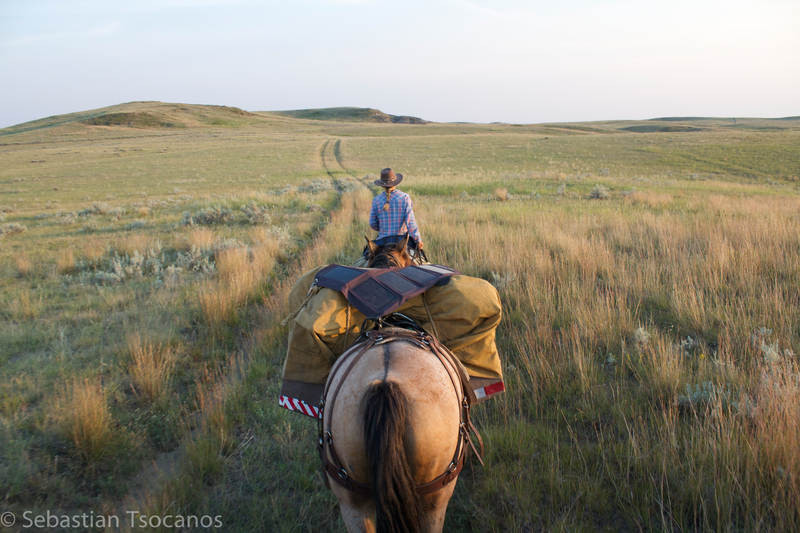 As we trailered the horses to Montana's Hi-Line, a thin stretch of country beneath the Canadian border, somewhere in the back of my mind was the concrete fact that once dropped off, our pace would plunge from 65 mph to a steady 4 mph clip. After unloading our horses and gear, I watched the truck and trailer ease through the barbed wire gate and out onto the highway. Watching the pick-up pull away from us across the black-top, I settled into the sharp realization that we were committed. Equally thrilled and terrified, we began to organize 300 pounds of gear into the four pack boxes we would live out of for the next 82 days. 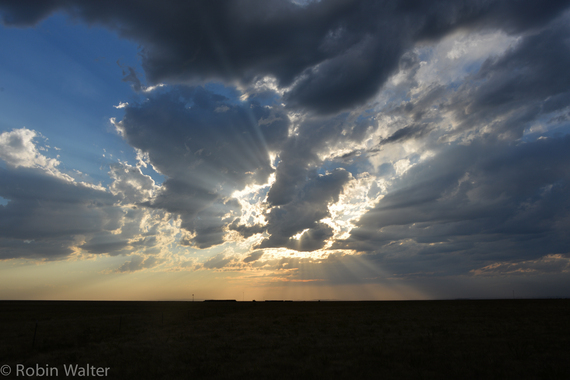 Armed with a tent, iodine, maps, fencing pliers, an inordinate amount of mac and cheese, and Larry McMurtry's Lonesome Dove, we set out across the Northern Great Plains. As it turns out, 4 mph was an optimistic estimate. Our average speed so far has hovered around 2.7 mph. Our glacial pace is due in no small part to Pearl, who often stops in the middle of the road to put her head in my lap, insisting on a little mid-morning ear scratch. Inching across this ecosystem with horses has allowed us to see and hear the thrum of life housed in the prairie's grasses. 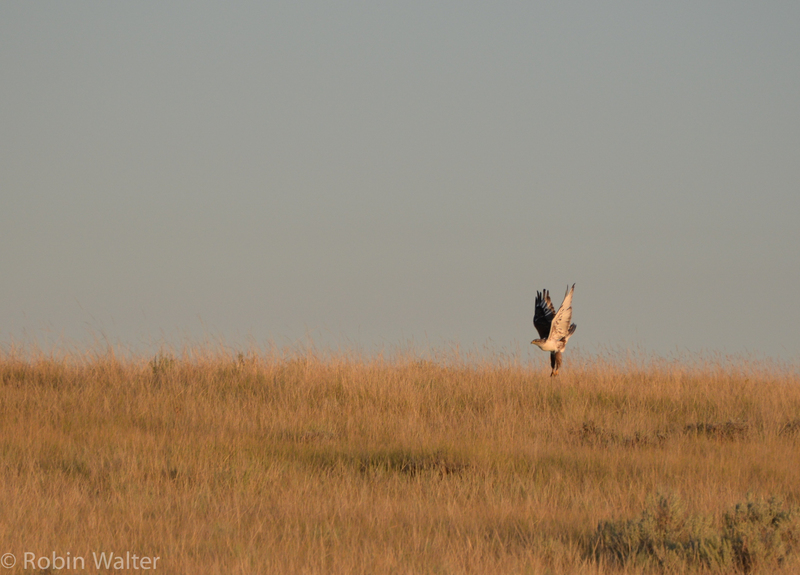 We constantly dodge sage grouse as they flush from beneath our horses. 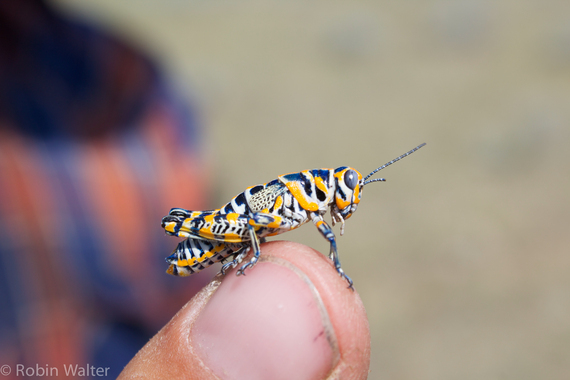 We've found technicolor grasshoppers hidden in the thick carpet of mixed-grass prairie and have spotted rare Ferruginous hawks flying low over prairie dog towns at dusk. We began the Rediscover the Prairie project to tell the story of an ecosystem that is being lost and to celebrate the work happening on the ground to preserve it. 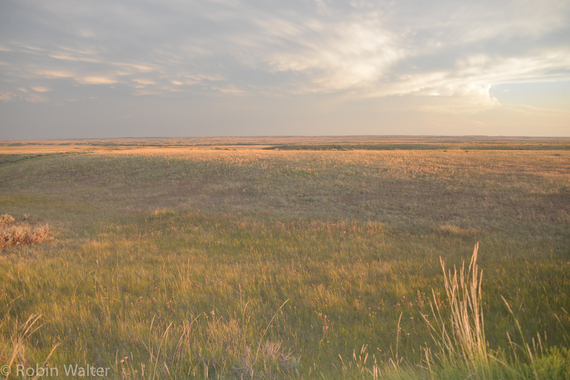 The region we're starting in is an astounding mix of sagebrush steppe and open grasslands. It boasts some of the most intact prairie left in North America. When we crest hills, sagebrush unravels around us until it fades into a hazy bluish horizon, uncut by power lines or highways. The native prairie in this area still has a stronghold on the landscape. The cultivated fields do not stretch in every direction, as they do in most of the Great Plains. Instead, they appear as dots in a landscape blanketed by a sea of native grasses. A favorite moment on the trail so far was my first glimpse of a Sprague's pipit. 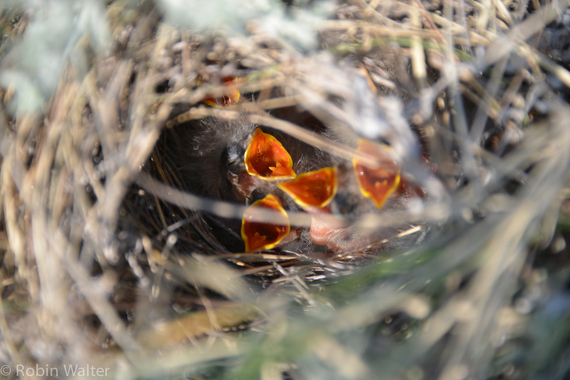 Accompanied by two field biologists conducting research on grassland birds, I parted a tuft of blonde prairie grasses to reveal a nest full of Sprague's pipit nestlings. The pipits' pink necks erupted from small down-covered bodies. Outrageous yellow-orange beaks opened expectantly as they waited for a nearby parent to fly in with a snack. Just five days old, the nestlings had not yet opened their eyes. About the size of a badminton birdie when fully grown, pipits have uniformly brown feathers and spend most of their time hidden in a maze of grasses, except when they take to the air to attract a mate. Weighing just more than an iPod Nano, Sprague's pipits have the longest flight display of any bird on the planet. They'll spend up to three hours singing and diving in the air without coming down once for a rest. Pipits, like many other grassland species, face an uncertain future. 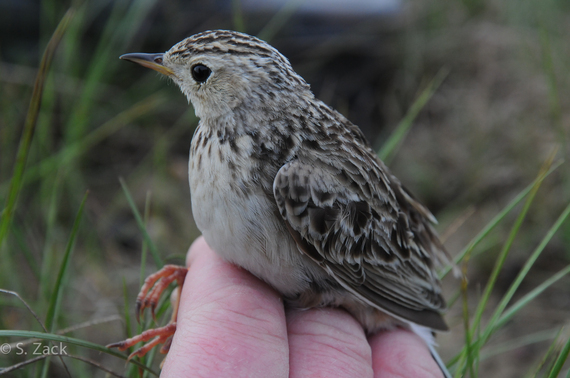 Sprague's pipit populations in North America have declined by 81.4 percent over the last 40 years. They depend upon a prairie that we depend upon for food, fuel, and fiber, and thus nest in habitat that, largely, we've plowed up. The mixed-grass biome where pipits occur has shrunk to 29 percent of its historical distribution. Habitat loss, fire suppression, overgrazing, and land and water mismanagement are among their largest threats. We saw the nestlings at The Nature Conservancy's Matador Ranch. Tucked into a remote corner of Phillips County, the 60,000 acre property operates as a "grass bank" for surrounding ranchers. Area ranchers pay discounted fees to graze their cattle on the Matador in exchange for conservation measures implemented on their own properties. 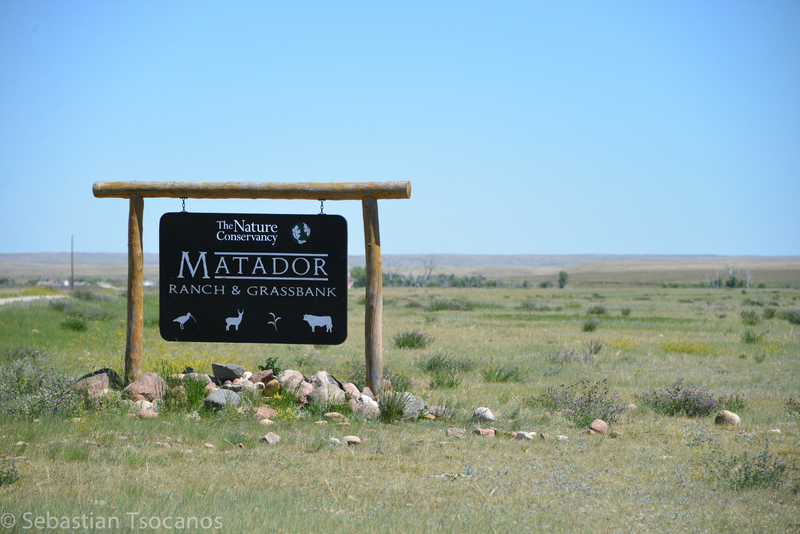 If ranchers maintain a prairie dog town on their ranch, for example, or use wildlife-friendly fencing, the price they pay for a lease on the Matador goes down. This model is so successful because it is a community-based approach. The Matador benefits the area ranchers by providing grass, and the ranchers benefit the Matador by providing cattle, a tool that can be used to maintain grassland health. 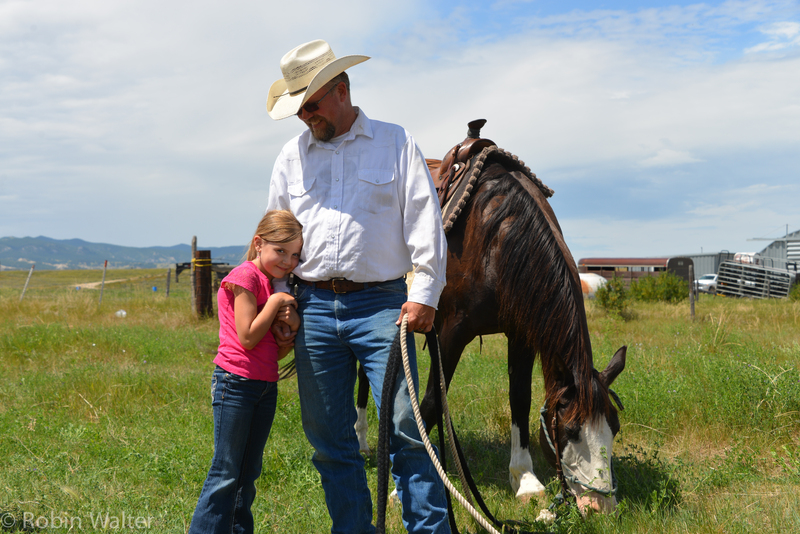 The ranch manager, Charlie Messerly, was born and raised in Malta, Montana, and has a feel for the way things work in the region. 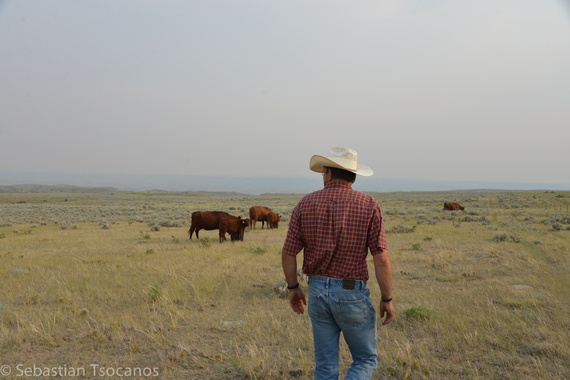 He respects the ranchers and their knowledge of the land they've been working for generations, and has created a management plan that reflects scientific findings on the ways grazing can help create optimal wildlife habitat. Taking advantage of the cool evening temperature, Messerly, his wife, daughter, and a few interns hopped on horses to show us around at sundown. We rode through expansive pastures where hundreds of rapidly declining grassland birds like Sprague's pipits nest in the breeding season. Layla Messerly smoked me in a race across the hayfields on her horse, Buster. After our visit to the Matador we wound our way along Highway 191 to the Fort Belknap Indian Reservation, home to the Assiniboine and Gros Ventre tribes. We had plans to meet with Tribal Council Chairman Mark Azure later in the afternoon. Spotting our motley crew on the side of the road during a lunch break, Azure pulled over in a black pick-up. We offered him a peanut butter and jelly sandwich, but he declined with a quick smile and graciously invited us for dinner at his family's home down the road. Azure has been instrumental to the tribes' ongoing efforts to reestablish a healthy bison population to the reservation. Bison were first reintroduced to the reservation in the early 1970's, after nearly 100 years of absence. Azure explained that his people and the bison have shared similar trajectories, from near decimation with the influx of white settlers in the late 1800's to the recent revitalization of both the tribes and the animals. Today the tribes continue to ensure the health of the herd, the land, and their people by carefully managing the herd for production, conservation, and cultural values. As part of this program in 2012, Azure welcomed "excess" bison from Yellowstone National Park into the reservation's herd. The move triggered reactions ranging from celebration, local opposition, to an injunction banning the transfer of federally owned bison to any reservation within Montana. The tribes won the case in court in 2013, and the bison appear to be on the reservation to stay. Another highlight was our visit to the Veseth Cattle Ranch. Dale Veseth is a fourth generation Montana rancher intimately connected to the land he works. 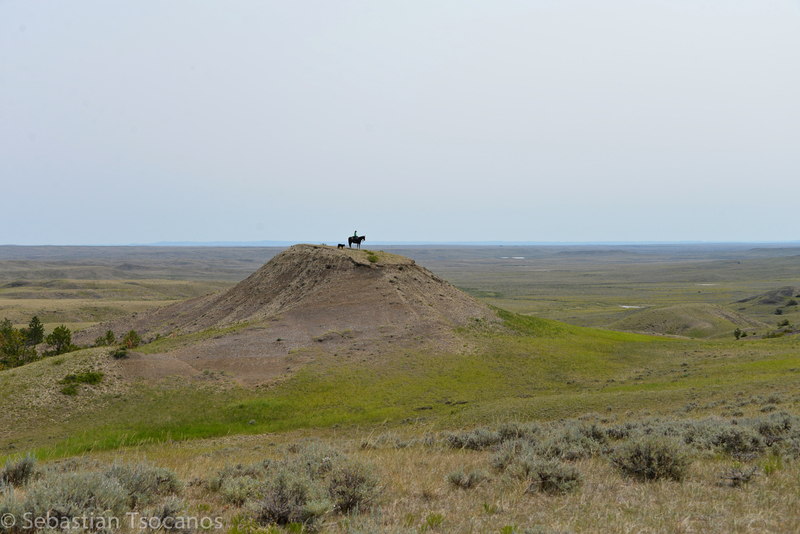 As we bounced down two-tracks in his truck to put out mineral for his cattle, Veseth explained he learned at a young age that the grass is the life force of the place. Thanks to the intensive rotational grazing system he uses, Veseth's pastures contain a diverse array of mixed grasses. 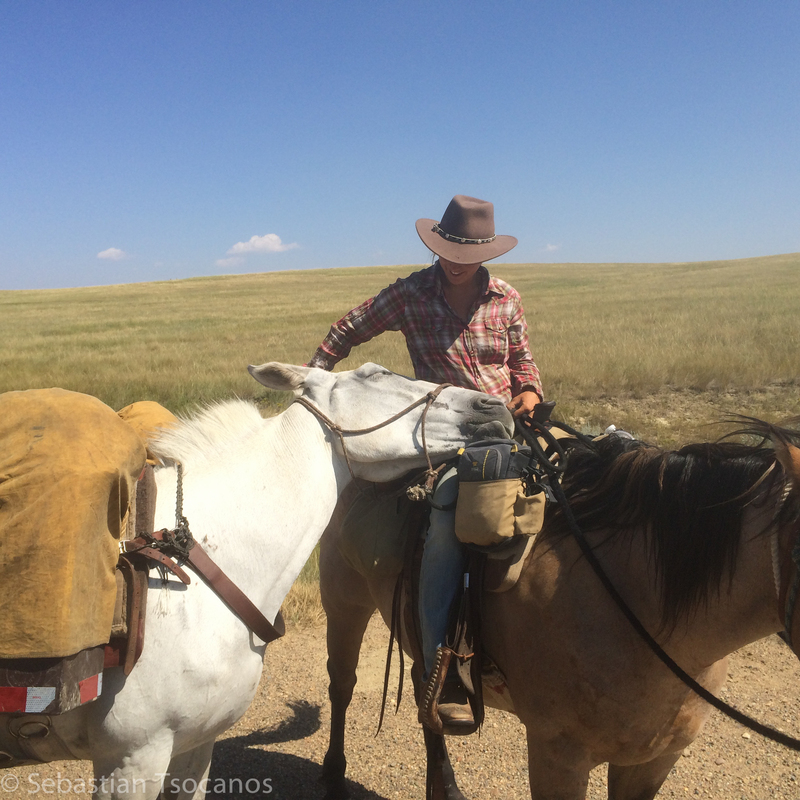 During our tour of the ranch, he pulled over periodically to point out Sage Grouse nestlings scurrying through shrubs, or to identify small brown birds erupting from the thatch of thick prairie grasses as the clatter of the pick-up drew near them. 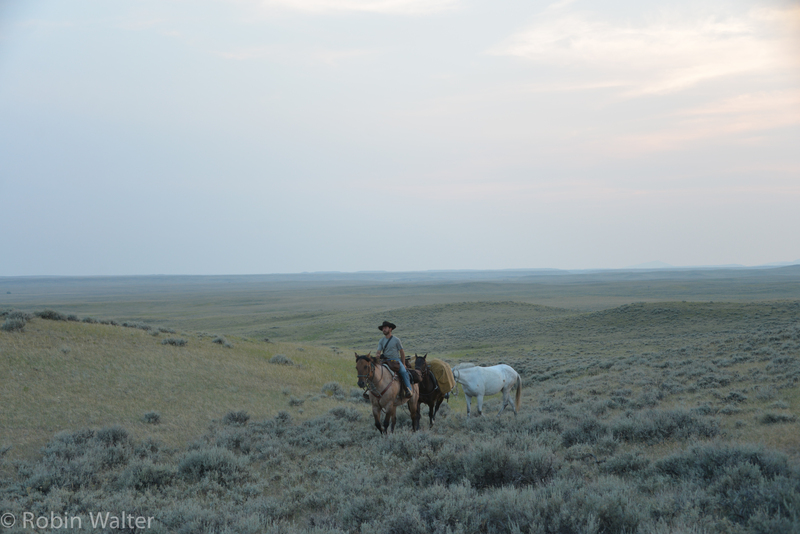 Over a dinner of ranch-raised beef, Veseth dove into the history of ranching in the west and the different areas of thought behind creating a sustainable future for the industry. He explained how, over generations, he and his neighbors have developed a deep sense of place, connected to each spring, coulee, and draw. Veseth helped found the Rancher's Stewardship Alliance in 2003, which aims to promote ecological, social, and economic conditions that generate biodiversity on the land and foster thriving rural communities. His partnerships with conservation organizations such as The Nature Conservancy, World Wildlife Fund, and Ducks Unlimited exemplify the ways in which ranchers and conservationists can work together to maintain grassland health. His wife, Janet Veseth, was kind enough to send us on our way with homemade banana bread and a large bag of aspirin for our saddle sore bones. As I write this, the sun is sinking low into an endless plane of horizon, silhouetting a cottonwood on the banks of a dried-up creek bed. The cutting wind that sent me into a tractor shed to hole up and write this has since quieted down and is bending tufts of cured grasses to the east. Kingbirds are drawing arcs in the evening sky as the birds sally back and forth from a nearby tree in search of insects. In the distance, I hear the switch of the horses' tails and the occasional billow of breath. The chime of the bell around Pearl's neck relays the pulse of the horses moving through early summer grass. I'm being eaten alive by mosquitos and am ecstatic to be out here. More to come as we head east a short ways to Lake Fort Peck, cross the Fort Peck Dam on the Missouri River, and head along the dry arm of the reservoir. 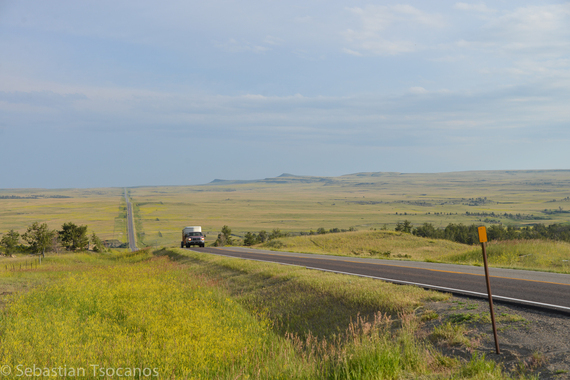 From there, we'll cross Montana's "Big Open" before we cross the Yellowstone River and wind our way along the Powder River up to the Big Horn Mountains in Wyoming.